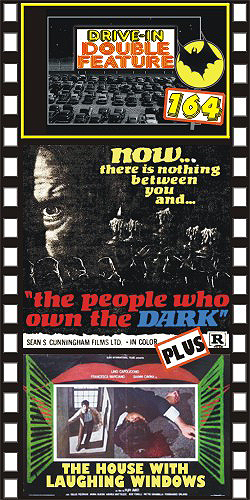 PEOPLE WHO OWN THE DARK (1976) Paul Naschy, Alberto deMendoza, Teresa Gimpera, Maria Perschy. This is a Leon Klimovsky apocalyptic sci-fi thriller about a group of rich capitalists and military men who hold a seedy party in the cellar of an old castle when nuclear war breaks out. Spared the ravages of radiation, they discover that local citizens are now blind. These citizens soon come calling in a sequence that’s reminiscent of Night of the Living Dead. Widescreen, beautiful color. PLUS: HOUSE OF THE LAUGHING WINDOWS (1976) Francesco Marciano, Lino Capulacchio, Gianni Cavina. An art restorer comes to a village to restore a fresco painted by a strange artist. After meeting the town's hunchback mayor, he senses a creepiness to the villagers—as though they are hiding something. He visits the house where the artist lived and finds strange-looking mouths painted on the windows. Soon his feelings of mystery turn to horror. An exceptional Euro-horror film. In Italian with English Subtitles. Color, scope, 35mm.